With information on over 1,400 innovations CHMI creates and enables research products that analyze promising practices, lessons learned, and the latest developments in health markets. View our latest publications below, and download additional resources and documents from our Document Library. Using the CHMI Database, the authors identified programs utilizing nurses and midwives that provide inputs most commonly associated with empowerment, including: higher education, professional training, and income generation. Featured in Nursing Outlook, the journal of the American Academy of Nurses. For leaders seeking to improve health systems, organizations that aggregate small scale private providers hold promising potential for impact. This brief details the role of these organizations who connect public sector goals with private sector actors. Intermediary organizations supported by policymakers, donors, and other health systems actors are able to help bridge the divide between sprawling public sectors and a wide array of small-scale private providers. CHMI’s research has revealed that intermediary models hold the potential to address the major challenges of fragmentation inherent in mixed market health systems. The International Center for Social Franchising provides evidence on how to expand primary care. Solutions include branding and marketing, franchising, providing alternative payment options for patients, and strategic partnering. The report recommends ways to promote the scale up of primary care – essential for improving the health of millions in developing countries. Developed in collaboration with the Global Impact Investing Network, CHMI produced health metrics for the IRIS metrics initiative. Healthcare organizations can select standardized metrics from this catalog to demonstrate how well they deliver affordably priced, quality services to the poor. These metrics can provide investors and investees with standardized definitions for common measures of performance. Download the Overview and Excel metrics. Published in the WHO Bulletin, CHMI's investigation into the uses of e-health and mHealth in 2012 was the basis of a number of subsequent publications on mHealth. The research explores the types of devices and applications used, drills into the ways in which ICTs are being applied by CHMI programs to improve access, quality, and cost. This report, a landscape from the Rockefeller Foundation's initaitive "The Role of the Private Sector in Health Systems in Developing Countries," was the foundation of the Center for Health Market Innovations. It describes 33 innovative pro-poor healthcare financing and delivery programs in South Asia and Sub-Saharan Africa that are led by or engage the private heath sector. The programs were selected based on their relevance to broader health systems and potential to achieve positive impact for poor people. 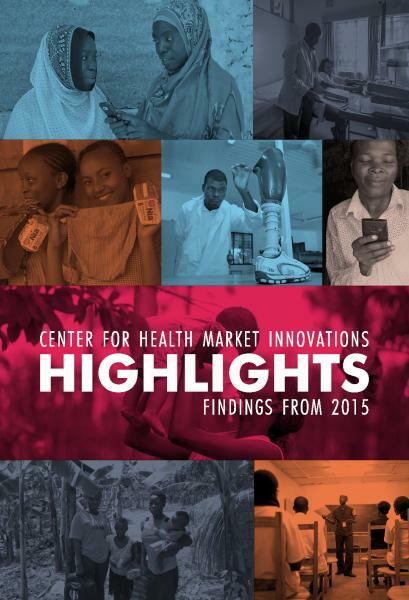 The annual publication from CHMI identifies emerging healthcare practices, documents and analyzes the impact of these practices, and spotlights 71 programs in low and middle-income countries that are looking to improve, scale-up and adapt to new settings. Produced with the University of Toronto, these briefs investigate new approaches to health market innovations for select priority health areas such as MNCH and TB. The Handbook represents the culmination of a year of activities of the Primary Care Learning Collaborative, an initiative of CHMI which facilitated knowledge sharing between chains and franchises providing high-quality primary health care in low- and middle-income countries. Written by implementers themselves, this Handbook shares knowledge in an open and ongoing conversation about concrete tools, approaches, solutions, successes, and failures, with the ultimate goal of helping organizations to scale and to overcome challenges. Promoting Adaptation and the Global Exchange of Innovation and The Adaptation Framework for Global Exchange of Innovation are two toolkits developed to support users interested in innovation translation to new contexts identifying potentially relevant practices - or active ingredients - and develop a plan for adaptation. The reports include an Adaptation Framework, a list of U.S. health system challenges and root causes, sample active ingredients for consideration, and an illustrative case study.